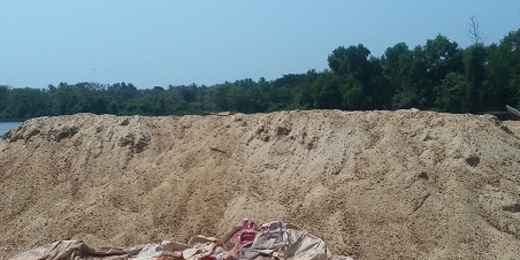 Kundapur, Feb 27, 2016: An illegal sand mining block at Kandlur was raided by the officials of the Mines and Geology Department on February 26, Friday. The raiding team seized machinery found at the site. and even razed the temporary sheds erected in the area. It may be recalled here that sand mining has been banned in the district until the licences for sand mining which are expired, are renewed by the persons concerned. The authorities who gathered hint that the sand mining activity was underway unabatedly in Kandlur, had raided the place on Friday. The place was raided even in December last year following complaints by locals. On Friday, officials even raided unauthorised sand mining sites at Basruru, Kavrady, Amparu and Gulvady.